My yoga teacher, Theresa Reed, always begins her classes by advising us to set our own intention for the class. But only recently did I begin to realize the true power of setting an intention. Setting your intention is a tool that can ground you, put events in your life into a larger perspective, and cause your mood for the day, if it was negative to begin with, to do a 180 degree turnaround immediately. Setting your intention works almost like magic — so here, to help you to think about this, I’ve added The Magician, who to me is almost synomymous with the idea of intention, creation, or the power of manifestation. If you need to have something happen, or have something turn out a certain way, it’s not a bad idea to call on your inner magician — and you do have one. I’ll prove it to you. But first a step back. What does it mean to set your intention? It means that you take a moment and think about your own personal purpose in doing something. Before a yoga class, it could mean that you stop to express your aspiration to yourself that the class will help you to become calmer, to destress, to stretch a tight muscle or muscles…whatever your personal goal might be. So where does the magic come in? It’s here: if you do yoga (to extend our example) without first setting your intention, you may indeed feel calmer afterward, or more peaceful or more energetic or whatever. Or, you might not. The fact is, you are much more likely to achieve your goal if you set it first. Why is that? Is it like making a to do list? Does it happen just because you remember to do it? Well, yes and no. Making a to do list is similar to setting your intention. And a to do list is a good manifestation tool. But, making a to do list is more like making a road map for how you are going to achieve your intentions. When you set your intention before an act that you are about to do right that moment, on the other hand, it’s more like saying grace before a meal. It can be a form of prayer, it can be a dedication, it can be an aspiration. So what good does that do? Tibetan monks have a saying: “Good in the beginning, good in the middle, good in the end.” This saying (which I heard in a talk given by Lama Kathy Wesley) has to do with making a dedication: dedicating your action that you’re about to commit (in the case of Buddhist monks, typically the act in question is prayer), for the sake of the benefit of all sentient beings, both before you commit the act in question, while you commit the act in question, and after committing the act in question. While Tibetan Buddhist monks might dedicate (i.e. set an intention for) the act of prayer, I want to point out to you that you can set an intention in this way for ANY act, whether it is prayer, eating dinner, doing yoga, reading a book, paying the rent, or whatever. Can I repeat that? You can set an intention for ANY act. Let’s go one step further: you can set ANY intention for ANY act. Let’s explore how this might work. It’s almost the end of the month. Soon I will need to pay my rent for July. As I commit the act of paying the rent (writing the check, mailing the check or handing it in person to my landlord, or whatever other actions are involved), I could set my intention. I could intend for my action to result in my family and I having a place to live. But I could also intend, as I write my check, that all people everywhere have shelter when they need it. Will my act of setting my intention provide shelter for the homeless? No. But it doesn’t do nothing, either. Here’s what it does: it changes the energy in the world and in me. While I can’t empirically verify the energy changes that might take place in the entire world, I can verify the changes in myself, especially if I compare this potential intention and the effect it has on my spirit with some other intention. If I intend for all people to have shelter when they need it, I feel peaceful and grateful for the shelter that I have myself. An instant sense of wider perspective on the situation. But what if I write my rent check while thinking how aggravated I am with my landlord for raising the rent? What if I am thinking about how many other bills needed to be paid for with that money, and now won’t be? What if my intention is to be grumpy with my landlord or to look grumpily at the lowered level of my bank account? What effect does THAT have on my energy and my spirit? It lowers my spirits, that’s what it does! The example above, by the way, becomes even more powerful if you apply it to sending money that is required by law but that you resent bitterly, such as alimony or child support to an ex-wife, or money sent to pay property taxes. The acts of making those payments can damage your spirit — or you can take the opportunity to mend and lift your spirit, by intending that your money that is sent out be put to good use, by intending that children and mothers everywhere have everything they need, by intending that your property taxes be used to pay good teachers for good schools, etc. Same act, different effect on you and your perspective and your mood. The difference between bitterness and contentment. All in one simple act: setting your intention. Are you convinced that this is magic yet? How do we get to “good in the end”? Simple: check back in with your intention after committing the act that you set your intention for. After my meal, I could say to myself, “I intend for that meal to energize me for the work that I must do.” Yes, it’s redundant because I presumably had already set my intention before the meal as well. But, that’s okay. When you set your intention not only before the act, but during the middle of it, and afterward as well, you make that intention stronger and you give it more power. What kinds of acts can we set an intention for? ANY act. Even breathing. If you practice setting your intention often, you’ll find that setting your intention, and checking back in with that intention, can be especially helpful when you are trying to keep your calm, keep your temper, keep from generally losing your cool. When you are trying to stay balanced. When you are trying to ground. Even at a time when you are in physical or emotional pain and you need comfort. For example, I can intend for the air that I breathe to travel through my body and heal the big toe that I just stubbed and make it stop hurting — and, it pretty much will. If I go into a meeting with an angry, confrontational colleague, I can intend that my calm voice and relaxed posture will keep me in balance, and chances are it will go one further and balance my colleague as well. I can intend to use the time that I spend stuck in a crowded waiting room to look around and practice paying attention to the energy of the other people in the room, or even saying a mental prayer on their behalf, intending that my practice or my prayer will somehow nudge the energy in the universe in some small way that will bring each of these people more happiness, and, whether my attempt to benefit a stranger in this way works on that person or not (I choose to think it helps them, but you are free to think I’m an idiot, I don’t mind), it will assuredly change my own waiting room mood from frustrated impatience and potentially rising anger into a playful “let’s see what I can accomplish here” frame of mind. Setting your intention IS magic. It’s magic you can access at any time and in any situation — and I can think of plenty of situations when, frankly, we need it. Even then, setting my intention, while it probably will not relieve my depression, can make a difference. It just might be that one small difference that would ground me enough and balance me enough to keep me going, however minimally, at at time when nothing else would. And if that’s not magic, then I don’t know what is. 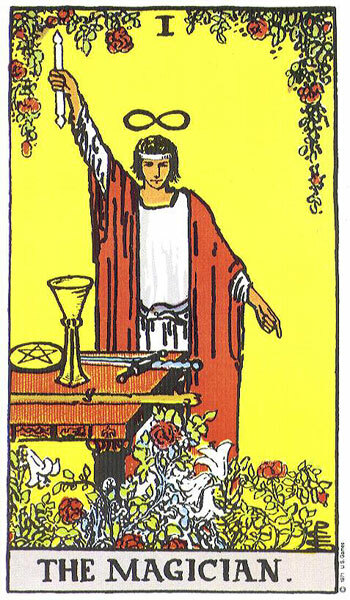 I love when the Magician comes up because to me, it means that anything is possible. Along with intention, we can open up to anything good the Universe has to offer, through us or by us or for us. Thanks so much for this post. It was very thoughtful, and I’ll be focusing on my intention more closely after reading this. Even if you don’t believe in Tarot this is an excellent article on turning every act and every mood into a holy thing which benefits everyone. Thank you so much for the reblog and your comment — I’m so glad that you liked the post.